For the last newsletter letter / e-blast of the year I thought it only fitting to tell you about the best Ontario Sparkling wines I had all year - since I usually put six reviews in this blast I'll pass along my top six bubbles (plus a bonus, just to spread the love around) - these are the wines you'll want to bring the New Year in with and share with your friends and family over the holidays, because without a doubt, Ontario is making some of the BEST sparkling wines anywhere. For those looking for more to keep them busy over the holidays ... there are plenty of videos to look at, podcasts to listen to and reviews to read. 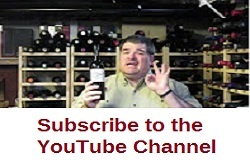 I would also like to take a moment to thank all of you for your continued support, follow me on social media and for your newsletter subscription - and I in turn will continue to deliver you great content and reviews of the best wines and news from right here in Ontario and around the world. May you all have a safe, healthy and happy new year and all the best for 2017.